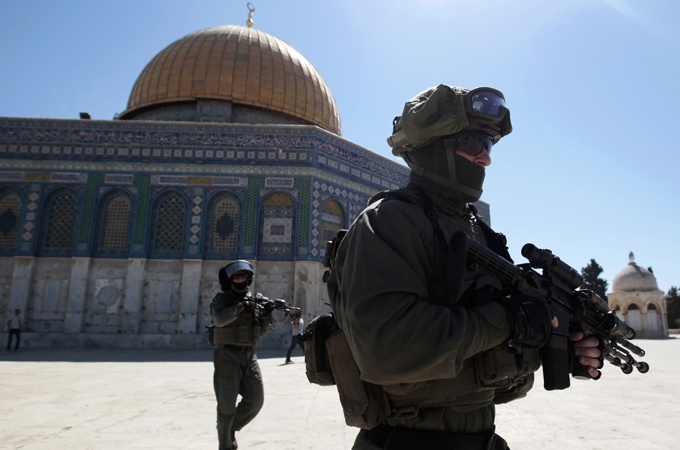 Israeli police have fired stun grenades to disperse Palestinian worshippers who threw rocks at them after Friday prayers at the al-Aqsa mosque compound, Islam’s third holiest site, police say. Dozens of officers entered the politically sensitive area in Jerusalem’s Old City on Friday to break up a demonstration of hundreds of protesters, Israeli police spokesman Micky Rosenfeld said. He added that two policemen were slightly injured and 15 Palestinians arrested in the operation. The mosque is part of a site revered by Jews as well as Muslims, and is a frequent source of friction. It was not immediately clear what prompted Friday’s clash. Israeli security forces had beefed up their presence in the area during the holiday of Rosh Hashanah, the Jewish new year, which began on Wednesday. Israel captured East Jerusalem including the walled Old City in the 1967 Middle East war and later annexed it as part of its capital in a move that is not recognised internationally. The compound, known to Jews as the Temple Mount, is the holiest site in Judaism. Known to Muslims as the “Noble Sanctuary”, it is Islam’s third-holiest site. The Western Wall, a remnant of the biblical Jewish Temple compound, is the holiest site where Jews can pray. Palestinians want East Jerusalem as the capital of a state they seek in Gaza and the occupied West Bank. Israel has said Jerusalem will remain its “indivisible and eternal” capital. The two sides resumed US-brokered peace talks in July after a three-year stalemate, though neither has expressed much optimism for a major breakthrough.